Gen Xtinct: LEGO: One-trick pony, or creative inspiration? Now, Jason Kottke argues that LEGOs are too single-use, that you can't find plain old LEGOs as easily, and it's harshing kids' imagination because they just build what's on the box. Lilly at Girlhacker strongly disagrees, and finds that her son loves to build the new kits, and doesn't feel his creativity's squashed at all. Kell's too young to do much with her garage-sale box o' MegaBloks yet, so I can't really weigh in with much experience, but I'm sure I'll find out soon. 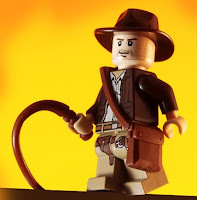 But I have to say I kind of love the LEGO Indiana Jones (home page here, including the heart-pounding Indy theme music). And this really makes me want to look at the Brick Testament again...the Bible via LEGOs! I actually had Loc-Bloc. Maybe they were like the poor man's Legos? They were only red, white and blue. I loved them nonetheless!